Houli and Saad did their community proud. 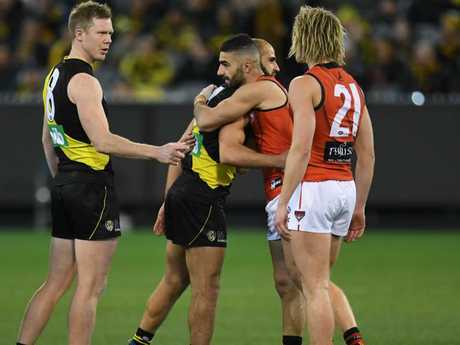 RICHMOND and Essendon stood against racism to start their clash at the MCG last night. While the Tigers' 12.9 (81) to 11.7 (73) win opened up an eight-point gap at the top of the ladder to all but wrap up the minor premiership and basically end the Bombers' finals hopes, it was before the first bounce the match had its most poignant moment. 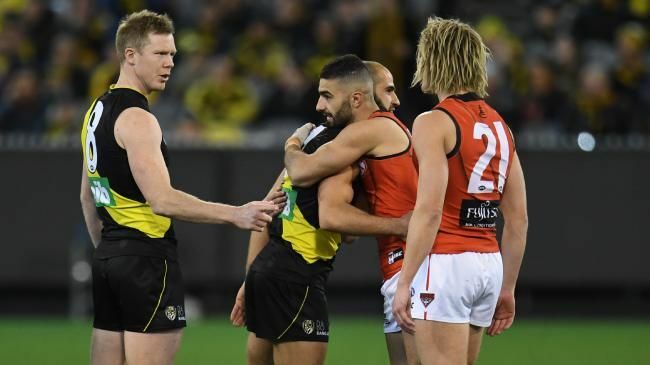 Two of the AFL's highest profile Muslim players, Richmond's Bachar Houli and Essendon's Adam Saad, stood with their captains at the coin toss and shook hands wither their opponents before embracing each other. In front of a crowd of 76,424 fans, the pair embraced in a show of solidarity to protest against the remarks of Senator Fraser Anning earlier in the week. One of the most iconic images of the year. The Katter Australia Party Senator called for an end to "Muslim immigration" in a speech, which has been widely pointed out to be both racist and inaccurate. Richmond coach Damien Hardwick said it was a touching gesture to support multiculturalism. "The thing about AFL footy is that it brings a lot of people together," Hardwick said after the match. "The one great thing about sport in general is the diversity of culture that we bring and our club, I think, is the most diverse in the competition. It was something our club thought was a good opportunity to stand up. "We've got the Bachar Houli Foundation, which is a really strong part of our fabric as a club, and I thought it was a great endorsement by both clubs to have their Muslim players out there before the game." The act received some negative criticism. 3AW's Tom Elliott said: "We don't need displays of political correctness before the game to make us all feel better. It's not what people go to the football for." However, plenty of fans and players were inspired by the gesture. Collingwood's American star Mason Cox was one of many to throw his support behind the gesture while the AFL's first female commissioner Sam Mostyn also joined the chorus of praise. The clubs issued a joint statement to announce the planned show of solidarity on Thursday. "Both Richmond and Essendon celebrate and embrace diversity in our great game," the statement read. "Through our players, staff, partners, members and supporters and, by extension, we celebrate the diversity of our country. "Both clubs will take the opportunity presented by the AFL's Friday night centre stage to stand alongside these young men and their community and remind everyone that our great game and our country values people of all cultures and communities." When it came to the game, Hardwick said he thought "it was a terrible game of footy but I was happy with the win". The Tigers held off a late charge by Essendon to win their 20th match in a row at the MCG. Richmond led by 33 points in the final term before the Bombers came home strongly. Bachar Houli stood up for his beilefs.